The 14th Street A, C, E and L train stop will be one of the first graced with Wi-Fi service. 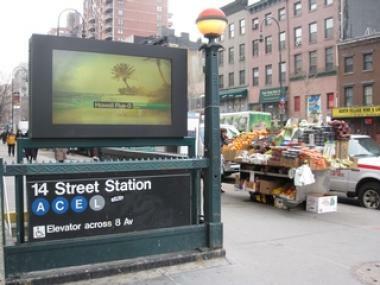 CHELSEA — Straphangers eager to stay in touch with the outside world while traveling underground will soon be able to surf the web at four Chelsea stations. The L trains stops at Eighth and Sixth avenues, the 14th Street 1/2/3 station, and the 23rd Street C/E station will be the first to be wirelessly enabled, WNYC reported on Tuesday. Riders at those stops will be able to connect to the net on the stairs, platforms, and mezzanines by the end of the year. According to the report, the rest of the subway system's 277 stations could up take four years to connect. Construction would involve laying fiber optic cabling under the street at each station, and would take about 10 to 14 days for the entire pilot project, DNAinfo reported in February. The 23rd Street C/E station is also in line to receive Wi-Fi service. Transit Wireless, the company behind the project, will charge telecom companies for the use of the wireless signal, and share the proceeds with the MTA. The authority is expected to make $30 million over 10 years. The MTA board gave Transit Wireless the green light in 2007, but project had been on hold until the company received financial backing. It got back on track last July after it received support from Broadcast Australia. The MTA plans to also deploy Wi-Fi and cell service on the Metro-North railroad between 97th Street and Grand Central Terminal. A timetable has not been set for that project, WNYC said. MTA spokesman Aaron Donovan told WNYC that wireless connectivity would translate into improved platform safety because the agency sends out e-mails, text messages, and Twitter alerts to customers for emergencies and service disruptions. “Having cell service in our underground platforms expands the reach and usefulness of those alerts,” Donovan said.